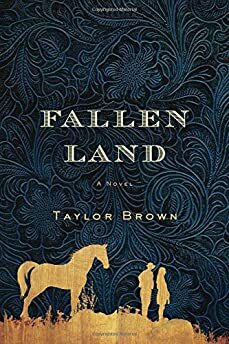 Largehearted Boy: Book Notes - Taylor Brown "Fallen Land"
Book Notes - Taylor Brown "Fallen Land"
Taylor Brown's novel Fallen Land is an impressive debut that has earned him comparisons to Cormac McCarthy. "Like McCarthy's Border Trilogy or Frazier's Cold Mountain, this is American literature at its best, full of art and beauty and the exploration of all that is good and bad in the human spirit." In some ways, I feel that my novel Fallen Land, set during the final months of the Civil War, is built of songs. The book began as a short story, and that story was inspired by an old frontier ballad, "When First Unto This Country," revived by the likes of Joan Baez and Jerry Garcia and Bob Dylan during the folk revival of the 1960s. The main character, Callum, an Irish orphan, has crossed the ocean, much like the old ballads of Ireland and England did, and much like those old songs, he must evolve and adapt to survive in this harsh new land. That narrative, and the haunting lonesomeness of these highland ballads, became my driving force throughout the novel. Later I played various songs as I wrote, working to translate certain moods or atmospheres into prose, and I actually dedicated the book to the musicians who keep alive the old traditional ballads of England and Ireland and Appalachia. In an essay for the Literary Hub, I discuss how I have zero musical ability, but sometimes I wonder if Fallen Land is my own performance of the music I love. Many of the songs in this playlist are traditional/authorless, though I've noted specific versions I like. This song was first recorded in 1934, during the New Deal era, but the first line can be found in Irish ballads over 200 years old: "When first unto this country, a stranger I came." The plot is simple. A young immigrant, probably Irish, steals a colonel's horse to pursue the girl he loves. I used that story as a starting point, but I was more interested in the feel of the song—how lonesome and haunting it is, how tender and sweet. I wanted to write a book to echo such songs, to rise soughing and skirling through the ribs like a wind. There are lyrical parallels in the novel, especially in the first chapter. For instance, Callum sets "his cap on bold" and wears "a coat of many colors, like Joseph's of old." I particularly like Crooked Still's version of the song, voiced by Aoife O'Donovan, but there are particularly sweet versions by Joan Baez and Jerry Garcia. I played this song again and again while writing the early chapters of the novel. It's something of a murder ballad, with a narrator accoutered in the trappings of the Old West—horse and pistol and hat—but who proves himself more contemporary serial killer than mythologized outlaw. To me, the song really succeeds in warping an old story into something new, casting a modern eye on the darker impulses that pump through the hearts of the outlaws and killers our nation has always worshipped. This was important to me in Fallen Land, especially as Callum is forced to commit violent acts, and he fears himself becoming a monster, unrecognizable to himself. And the Brits would hang me for a Fenian, so I took my leave of there." In Fallen Land, Callum's father was "hanged for a Fenian in '53." I stole this idea directly from the song, much as Earle stole his narrator, and the fact that most Irish fought for the Union helps explain Callum's outsider status among the guerrilla band he's fallen in with, even before he rebels against them. This song, to me, describes the kind of hard-won, bone-deep love that binds Callum and Ava together—a love born in the darkest valleys of the soul and carried like a lantern through the shadows. The narrator says, "I'm not afraid of the dark / When the sun goes down / And the dreams grow teeth / And the beasts come out / You can reach for me / I'm not afraid of the dark." At different times, I feel like Callum or Ava are saying these very words to each other. It's obvious to me that neither would have survived more than a few days on their own, and they take turns being the "strong one" when necessary, when the other is especially broken-down or anxious or hurt. I believe I first heard this song on an episode of Scrubs, but I can't confirm. Much like Steve Earle's "Dixieland," this song is narrated by a Civil War soldier—though this time it's "a rebel boy...born on the banks of the Shenandoah." I find the youthful, upbeat, almost joyous delivery of the song particularly moving, coupled as it is with the description of misery upon misery: "Dressed in rags and we ate like rats / When they cut off our legs we cried." The narrator is asking the listener to "carry him back to Virginia." Later we realize he's already dead—he's asking to be buried in the land of his birth. His is the voice of someone frozen in time, cut from the earth at the very height of youth and enthusiasm—much like Ava and Callum might be. Important, too, was the sheer sense of scale the song evokes: "And we died in the valley / Died in the swamp / On the banks of the river where the whitetail jumped / Died in the ditches / Died in the fields / In the belly of a wagon before our wounds could heal." We forget that more than 620,000 American soldiers died in the Civil War—more than both World Wars, Vietnam and Korea combined. I hoped to capture that sense of scale at certain points in the novel, and this song was a constant reminder. This is my favorite English ballad of all time, and it dates back all the way to the 1600s. There are many variations, but the basic gist is that a young man, known as Matty Groves or Little Mattie Groves, has an adulterous tryst with a lady, whose nobleman husband finds them in bed together. Violence ensues. The relationship between Little Mattie and Lord Donald echoes that of Callum and the Colonel—a rootless youth pitted against a man of power and station, with a woman caught between them. As with many of the old ballads, there is little sentimentality here—this is no triumph of David over Goliath. Lord Donald kills them both, lover and wife. I strove for such an unflinching narrative with Fallen Land, so that readers will not be comforted by any certainty of a happy ending. Now this is cool: this well-known Appalachian folk/bluegrass ballad arose sometime in the 18th-century from our previous song, "Matty Groves." The tune is very similar, and the lyrics became mysterious, even ambiguous, as they wended through the mountains of Appalachia. There are hundreds of variations. The name "Shady Grove" may refer to a place or person. The song, coupled with its antecedent "Matty Groves," is a prime example of a "living song," dying and birthing and evolving over the centuries—a narrative arc which parallels that of our Irish-born protagonist, Callum, who must evolve and adapt to survive in the bayous and mountains of the American South. What's more, I found something of Callum's longing for a peaceful, domestic future in the song: "Wish I had a big white horse / corn to feed him on / pretty little girl just to stay at home / and feed him when I'm gone." When Callum imagines a life with Ava, with fireflies winking like tiny lanterns in the dusk and a band of gold gleaming on her finger, a baby in her arms, there is something of this song lingering in the scene. I first came across this song on a 1991 album from Columbia Records called Songs of the Civil War. It seems to be narrated by a Confederate veteran who is the very definition of unreconstructed, and it expresses disaffection with even Revolutionary principles ("I hates the Declaration / Of Independence, too"). Some say it was written by one of Lee's aids. The lyrics are extreme, even boastful. But the song did help capture the attitude of the Confederate guerrillas in the story, who fashion themselves the "greatest Yankee-killers in the land," and may well become a kind of unrepentant, guerrilla-spawned James Gang of the Deep South—if they live that long. Writing in a historical setting allows you to tell the truth, but "tell it slant," as Emily Dickinson said. Steve Earle says he didn't write this as a gun-control song, but it became one as his politics evolved. For the novel, the song was important in a few ways. There is the balladic evolution of a young man tumbling down a violent path—much like Callum—and the notion of using a historical setting to speak to the present. Lastly, there's the metaphor of a pistol as a devil's hand, which I expanded into a pointing finger of judgment, such as when the horsemen "smiled from behind the long barrels of their weapons, pointing him down." This is one of the best-known folk/gospel songs to originate in the early 1800s, and the first lines virtually encapsulate the spiritual and physical journey of Fallen Land: "I'm just a poor wayfaring stranger / I'm traveling in this world of woe / Yet there's no sickness, toil nor danger / In that bright land to which I go." Callum and Ava are "poor wayfaring strangers," and "that bright land" is the coast—the land of their hope. This song, along with "When First Unto This Country," probably had the most powerful influence on the narrative and atmosphere of the book. 16 Horsepower's rendition is especially haunting. I believe I first heard it in a documentary called Searching for the Wrong-Eyed Jesus, which I watched while writing the first draft of Fallen Land. In 2002, I was in a museum in London—I can't remember which—but I can remember the girl I saw working there. She had black hair, long and ragged and wild like a mane, and the bluest blue eyes—almost otherworldly in their sheer incandescence. Seeing her, I think I felt something similar to what Callum feels first seeing Ava, and Steve Earle captures that moment for me in this song: "And I ask you, friend, what's a fella to do / 'cause her hair was black and her eyes were blue." That sense of awe, of plumb amazement and crazed pursuit, is behind Callum's actions early in the book, when he steals the Colonel's horse to go after Ava. It's no secret that my favored steed has two wheels. I'm the founder and editor of a custom/vintage motorcycle blog, BikeBound.com, and the allure of the motorcycle is as powerful to me as that of the horse. I believe this song, written by English singer-songwriter Richard Thompson, is perhaps the greatest outlaw ballad of the modern era. It's romantic and tragic and violent, and the lyrics read almost like a midcentury incarnation of the traditional ballads in this list. Here the highwayman is an armed robber, and his steed is made of steel and chrome. Often I refer to Reiver, the horse in Fallen Land, with machinelike descriptors ("ribbed engine of flesh" and "machine that ran on blood"), and I think there is something of the Vincent motorbike in his makeup—a machine of unparalleled mystique, of which Hunter S. Thompson once wrote: "If you rode the Black Shadow at top speed for any length of time, you would almost certainly die." This is one of the most widely-performed traditional Irish songs of all time. It's the story of an Irish highwayman or Rapparee (17th-century Irish Jacobite guerrilla fighter), who robs a British military official—here, Captain Farrell—in the southern mountains of Ireland, only to be betrayed by his lover or wife and sent to prison, anchored to a ball-and-chain. The song became popular in Colonial America for its defiance of the British, and Irish soldiers of the Civil War sang a similar tune about taking up arms in service of Uncle Sam. This song certainly informed Callum's character and story. An Irish-born horse thief defying a cavalry officer in the mountains of Appalachia—Fallen Land could almost be the American evolution of this very song...though Ava is unlikely to betray Callum, and the cold, wet ground is the main prison they face. Thank you for taking a look at my Fallen Land playlist. I hope some of these songs move you as much as they do me, and perhaps they might enrich your reading of the novel.